Restaurateur Kevin Gillespie aims to re-create the Southern comfort fare of his grandmother's Sunday dinner table. : Atlanta-native Kevin Gillespie's Revival aims to re-create the comfort fare he enjoyed at his grandmother's Sunday dinner table. 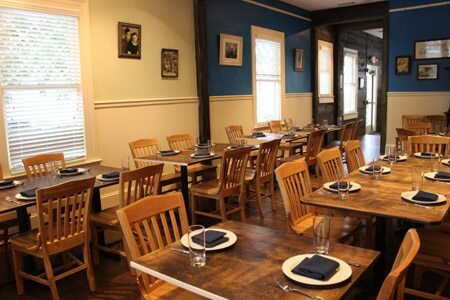 Gillespie teamed up with executive chef Andreas Muller for this Decatur restaurant. Gillespie found the perfect structure for his establishment, with its wide front porch capturing the Southern architectural language, and the side patio and picnic tables along the front evoking traditional dining customs. Toasted deviled ham tea sandwiches may not have appeared at that Sunday table in exactly the same form, as the ham in this version is very finely ground, whereas the classical Southern deviled ham is much chunkier. But they make a tasty morsel, especially with a glass of Familie Bauer Zweigelt rosé from Austria. We thought it worked, although we believe at least a few Georgia wines would have kept the faith better. Savannah red rice, an aromatic, complex and rarely seen dish, accompanies creamed Georgia white shrimp. Also available is fried chicken, of course, its coating quite dark. Rich mac 'n' cheese, the South's only pasta dish, arrives in little blue-lidded pots. Don't miss the lemon icebox pie; its form is much fancier than anything grandmother would have prepared, but it’s delectably tart and cool.